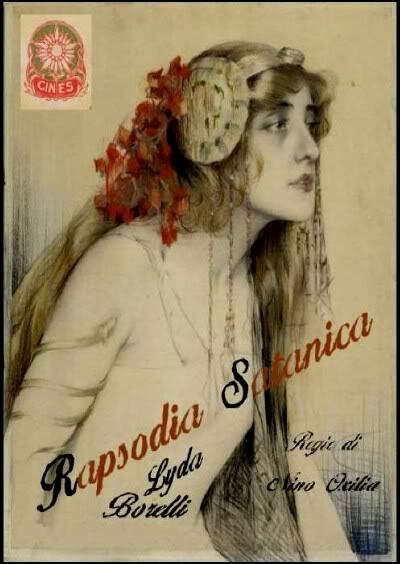 Death, love, and beauty: Lyda Borelli in Rapsodia Satanica (IT 1917) | Silents, Please! 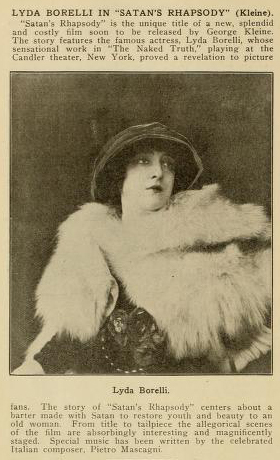 Lyda Borelli is the star of this update of the Faust legend. 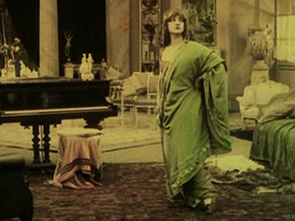 La diva Lyda plays Contessa Alba d’Oltrevita, who at the beginning of the picture is an elderly woman, looking on jealously at the youthful beauty that surrounds her. When Mephisto appears with a bargain for her – her youth and good looks restored, with the proviso that she cannot fall in love – it takes little for her to be persuaded. Mephisto takes her by surprise, but she agrees to the bargain, and throws down his hourglass to seal the deal. Alba preening, delighted at the return of her beauty. She heads to the local festival, full of flowers, people, dancing, and music; men flock to her. It’s there that she meets brothers Sergio and Tristano. It’s Tristano she likes, but Sergio falls for her, quickly and hard; she simply scoffs at him, too busy enjoying herself. There is a letter: “I’ll wait for you under your window. If I don’t see you before midnight… I will die in front of your house.” Tristano goes to her and entreaties her to stop Sergio, but she is too caught up in herself and in Tristano: Sergio shoots himself. From there to a series of scenes where we watch Lyda thinking, hoping, and dreaming in the dance-like mannerisms so particular to her. 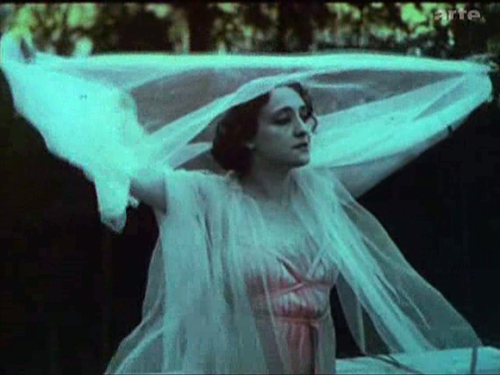 Clothing plays a large role: Borelli continually uses it to emphasizes the movement of her body, dressed throughout the film in the Fortuny and Poiret gowns that she favoured, replete with floating silk wraps and draped veils: very reminiscent of the Loïe Fuller’s famous serpentine dance. 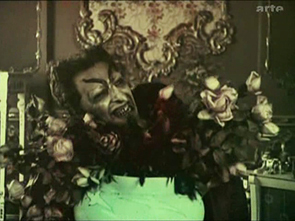 Watching the visual richness of the costuming and staging in Rapsodia Satanica (not to mention the striking and lavish the use of colour) brings to mind Tom Gunning’s influential model of the ‘cinema of attractions’: the idea that early cinema was more about aesthetic impressions, spectacle, and visual attractions than telling a coherent story. As a corollary, the framework for making, understanding, and receiving these films was different than what we expect now, after many decades of narrative-driven cinema. Gunning was talking about an earlier period than that of Rapsodia Satanica, but then again, narrative cinema, and all its hallmarks that we take for granted today (goals, structures, editing techniques) was still being refined and institutionalized in the teens. And as he writes, “the cinema of attractions does not disappear with the dominance of narrative, but rather goes underground, both into certain avant-garde practices and as a component of narrative films.” Consider Busby Berkeley’s kaleidoscopic dance sequences, Len Lye’s painted films, the Broadway Ballet sequence in Singin’ in the Rain (1952) … even the requisite explosions in your typical Hollywood blockbuster are as much (or more) about spectacle than storytelling. So for me, it’s a useful concept – and an applicable one to the visual feast of Rapsodia Satanica, a film which carefully avoids any hint of realism. The way to watch films like this is to enjoy them for what they are – in this case, a strange phantasmagoria from the past. Otherwise, you will end up disappointed like this IMDb reviewer, whose commentary proves that one person’s trash is another’s treasure. Rapsodia Satanica is one of the heights of Italian aestheticism. It exists in a dreamlike world of melodrama, fueled by the dramatism and lyricism of Lyda Borelli’s acting. The director, Nino Oxilia, died young in WWI. One of the key diva directors of the mid-teens, one must regret that we do not know what he would have gone on to do. And special mention must be given to the incredible beauty of the film’s colours: it is tinted and toned throughout, also featuring stencil colouring in many scenes. Moving Picture World, 25 July 1914. 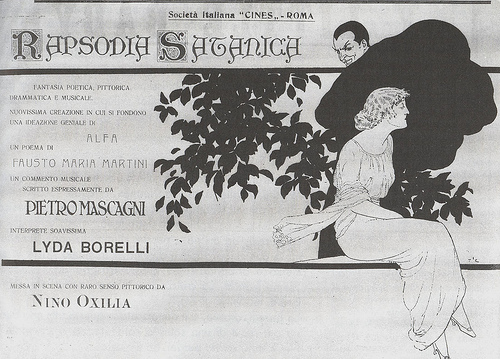 Advertising for the film makes mention of Pietro Mascagni score, which fits beautifully with the film. On the copy of Rapsodia Satanica that I have, it is performed by the Staatsphilharmonie Rheinland-Pfalz. Let’s have a look at the diva-riffic properties of Rapsodia Satanica. Copious costume changes. Eleven by my count, or one outfit per four minutes, and they’re all stunners. A great deal of sheer silk is involved. Symbolic naming. Alba d’Oltrevita, lit. ‘Dawn over life’. Mirrors! So many of them. Lady Alba looking into a hand mirror as an old woman, and then after she becomes youthful. Lyda admiring her reflection in a fountain. Distress as she sees a wrinkle on her face. Alba as she looks upon her reflection before veiling it … this reinforcement of themes such as beauty as artifice, doubled selves etc. is none too subtle. Feminine sufferance. Being unconvincing old; faded beauty. Two brothers being in love with you, one of whom has read Romeo and Juliet a few too many times. She veils her face, the priestess of love and death. Unintentional comedy. Where will that Mephisto turn up next? Outside the window, behind a vase, busting a groove up a tree? 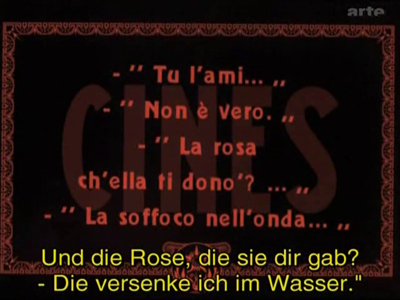 An iconic piece of Borellismo that was used in both Diva Dolorosa and Gustav Deutsch’s Film Ist. Mephisto makes a suitably dramatic entrance, emerging from a painting. At one point, Borelli holds a cat which is violently trying to squirm out of her grasp. Ladies and gentlemen of the jury, I rest my case. Rapsodia Satanica is a beautiful and stylish film and quite probably the diva film par excellence. 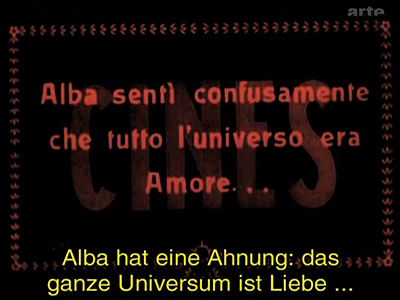 Just in case you were wavering, here is, again, the painted scene used by Cineteca di Bologna as an opening sequence on their last couple of DVD releases. Rapsodia Satanica [Satan’s Rhapsody]. Dir. Nino Oxilia. Roma, Italy: Cines, 1917. RS was filmed in 1915 but did not see release until 1917, so it has been attributed to both dates. I am greatly hoping that this will receive a DVD/BR release in the next years. The Cineteca Milano have made it available here on the European Film Gateway, without the accompaniment of the Mascagni score. This entry was posted in Film and tagged cinema of 1917, cinema of Italy, clothing & fashion, diva films, EFG, floral symbolism, Lyda Borelli, Nino Oxilia, traces of Loïe Fuller. Bookmark the permalink. this film is *stunning* Thank you so muhch for this article. Is this or has his been available on DVD anywhere?? MADDIE! 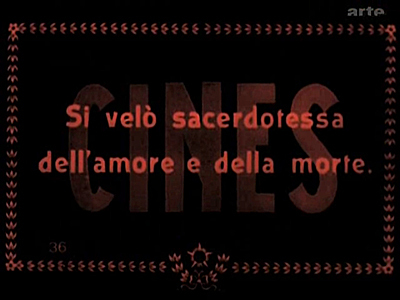 <3 Rapsodia Satanica isn’t on DVD (one day …), but I have a digital version – we should break out the absinthe and watch it together sometime! Didn’t we watch Il fuoco a couple of years back? (the one where Pina Menichelli wears the owl headdress)? You’ll definitely like Rapsodia Satanica. OMG HEY!!! :D yes lets watch it!!! :D Name a weekend! My time is much more free lately! Maddie! It’s availabe here on the European Film Gateway (I added that info to my post), but that is a truly silent version – no Mascagni score, which is a shame as it’s a really lovely score. So your best bet is probably this version on YouTube. Also, last weekend I threw a party at which we ceremoniously burned a wicker man that I had constructed. It was also your birthday that weekend … coincidence? Wish you could have been there! i’m writting a graduation thesis about silent movie and music. But is very hard to found the original sound track. Grazie per il commento, e quale tesi interessante! Non so se la partitura di Mascagni è online, ma ho tre idee per aiutare trovarla. 1. Il compositore e direttore d’orchestra Timothy Brock a fatto un restauro della colonna sonora di Rapsodia Satanica, lui ha scritto un articolo qui: http://www.timothybrock.com/joomla/articles/18-articles/86-rapsodia-satanica. Menziona diverse partiture, e ringrazia “the Mascagni Foundation, Mascagni’s publisher, Ed. Curci-Milano, the Cineteca di Bologna and to Maestro Marcello Panni whose invaluable score reconstitution helped me enormously”. Perciò, ti suggerisco di contattare Mr. Brock e/o queste altre organizzazione. 3. Finalmente, al WorldCat c’è due resultati: http://www.worldcat.org/oclc/145022899 e http://www.worldcat.org/oclc/17704856. Immagino che vostro università ha un prestito interbibliotecario.